The Khasi people live in the Khasi and Jaintia hills of Meghalaya. Khasi is a generic name given to various tribes and sub-tribes who live there. They had migrated from the Southeast Asia to the hills of Northeast India. They have a number of clans such as Lyngdoh, Diengdoh, Marbaniang, Shiemliah, Lapang and Songkali. The Khasi are generally people of short stature. Their mother tongue is Khasi. 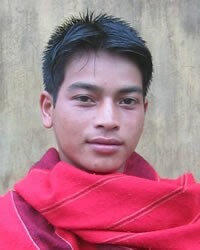 They are divided into several matrilineal clans such as Mawlong, Khongweer and Symley. The youngest daughter inherits the ancestral property and daughters are given preference in the division of property while males can own only self-acquired property. Even Christians are known to pass down their ancestral property through the female line. Khasi women enjoy a high social status and play a significant role in socio-economic matters and household management. Many Khasi have taken up professions in civil services and in industries besides agriculture. Western Music and musical instruments are becoming popular among them. A vast majority of the Khasis are Christians while there are some groups of Hindu and Muslim too among them. 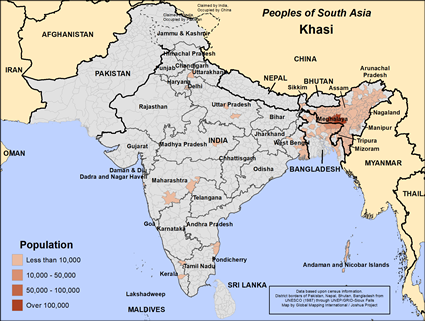 The Khasi Muslims came from the other states such as Bihar, Uttar Pradesh and Punjab. They came as traders to the Jaintia hills of Meghalaya and married Khasi women. Among the Muslims too the youngest daughter inherits the parental property. Boys are circumcised before the age of ten. The Muslim Khasi mainly depends on trade and white colour jobs. * For the salvation of the Khasi people. * For the Khasi Christians to reach out to the Khasi Muslims and Hindus in their region. * For social equality in matters concerning the genders.View Khasi in all countries. Location in Country: District of Moulvibazar.